Youre wrong and you should stop now. I wont ridicule you or call a tart, I promise. Finish the sentence. You wouldnt say "Strings is older than me am." You'd say "Strings is older than I am." I'm only old because I was born without my consent! .... And you're like a decade older than me. I will take this as a win. You're not a very gracious loser. 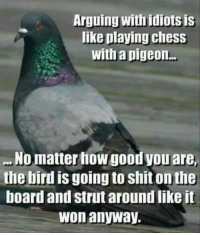 He can't back out by saying it's like arguing with a pigeon. He was wrong, all he had to do was be a big man and admit it and move on. I'm not gonna lie that looks like fun. oof, it was 12°F(reedumb) outside for my run this morning. Even the dog was reluctant to go. Still made it 5 miles, but I think I might be an "innie" now, in the nether area. Ran 4 miles this morning...then stopped and picked up a donut on the way home. I don't wear socks, so I would have been doomed.